We are a very friendly club who welcome anyone no matter what your age or ability. We have a very mixed membership of abilities from marathon runners to Mr & Mrs Average who want to keep fit, shed a few pounds while making new friends in the progress. Running is a great form of exercise and you will love the freedom of the open roads and countryside while running with friends. 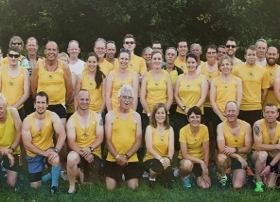 Host the Essex and Halstead Marathon every May.